Christ is risen! He is risen indeed! I know Easter is over but this is still a thrilling thing to celebrate. My weekend involved fried fish, plenty of hot cross buns and I made my way to the beach. Who could ask for anything more? I hope you had a good weekend too. As usual, I’ve got pictures from my days that don’t quite fit in any one post, but I want to share them with you anyway. Let’s go through them shall we? 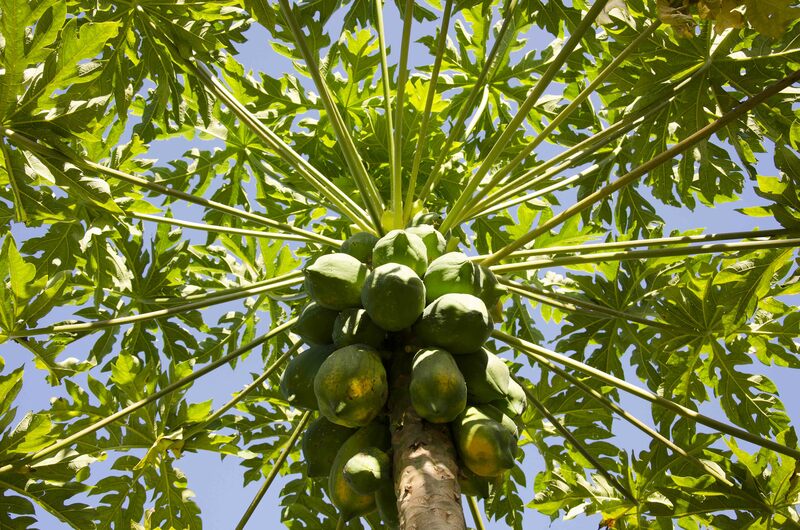 First this glorious papaya tree, from my Aunt Moneira’s garden. She has an amazing green thumb, in a way that I find a little intimidating. You know, it’s probably more accurate to describe what she has going on as a farm. This year she’s harvesting tomatoes, carrots, turnips, radishes, beets, kale, chard, bok choy, sweet peppers, okra and probably other things I’ve forgotten. My farm goals are far less ambitious: if one day I have some herbs and a leafy green, I’ll feel like a queen. I took this one evening at the beach with family. We went to breathe the sea air and watch the sunset. There was a father and his toddler son there too, splashing about in the too-cold-for-us waves. 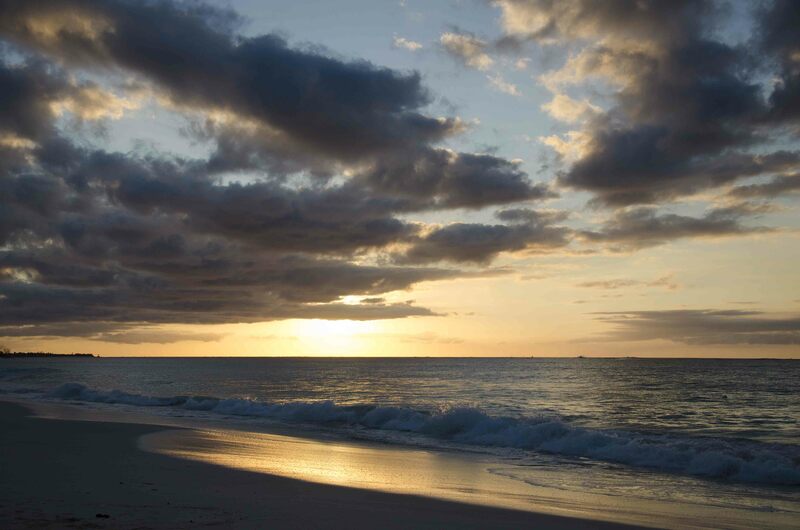 As dusk drew nearer we looked intently for the fabled green flash, immediately after the sun sinks beneath the horizon. If you see it and make a wish for someone else, it’ll come true. My uncle announced happily that he saw it, which means I must have, because I never blinked or looked away. 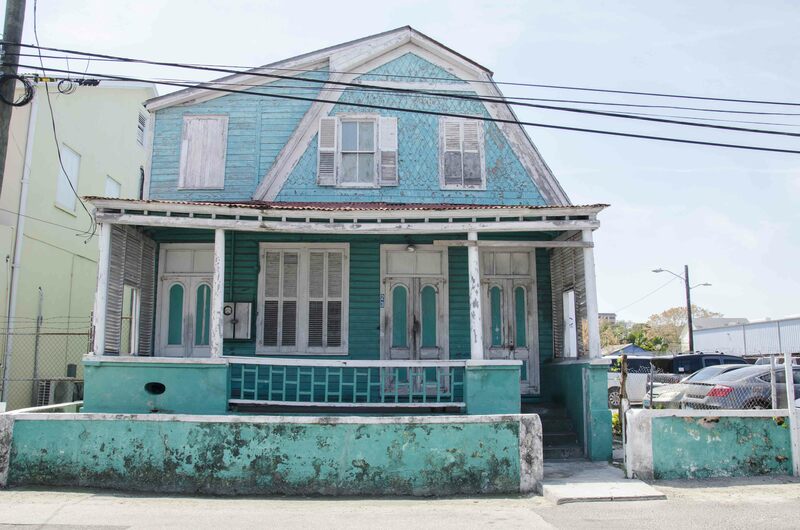 Though I’m not confident about the flash, I finally saw this turquoise house a few weeks ago, in a way that I never have before. It’s clearly been around a long time. The shutters, screened porch, elevated foundation and curious roof give it away as an historic building even more so than the peeling paint. I’ve been driving past this place my whole life, but the other day I walked by and couldn’t believe I’d never noticed it before. Isn’t it lovely? I wonder what stories it has to tell. 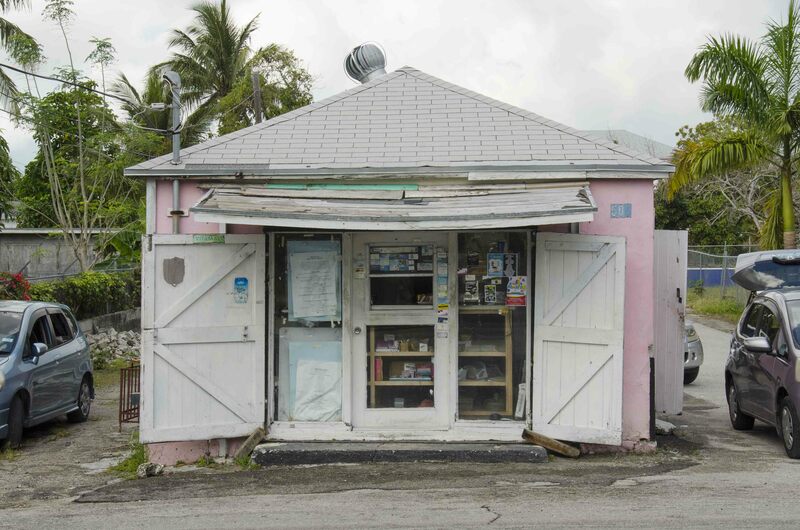 In keeping with things I’ve been seeing my whole life, this place: the Pink Shop. It’s on the same road as the school I went to from kindergarten through 12th grade. When I was really little it was painted brown, and everyone called it the Brown Shop. I vaguely remember them painting it sometime in high school, then we had to update its name. Many of my classmates used to get breakfast there on their way to school, or walk there at the end of the day for a snack. I think I went once with friends; it felt like an adventure. After I took this picture I stopped at the window and was amazed at how big it is inside, though it continues to be a walk-up operation. Lorraine told me they’re famous for their sandwiches and apparently have great rotis, which I’m now planning to try. 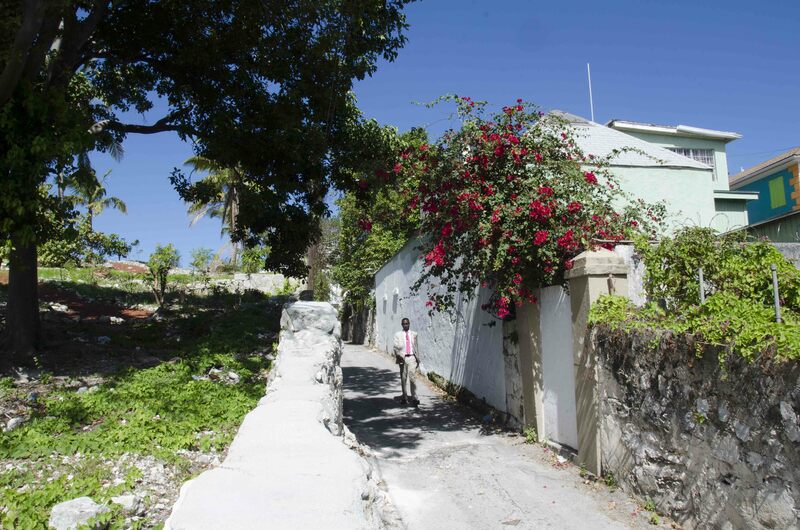 This is Hospital Lane, one of the oldest streets on the island. It goes back at least to the late 18th century, when it ran parallel to the first African Hospital. I snapped this the same afternoon that I picnicked at the NAGB. When I got to the wall and saw this man I thought wow! It looks just like a painting! I couldn’t have even dreamed of this scene. I’d never seen anyone walk down this street before. Lastly, the roofs of St. Francis Xavier Cathedral, from that same day in the NAGB garden. 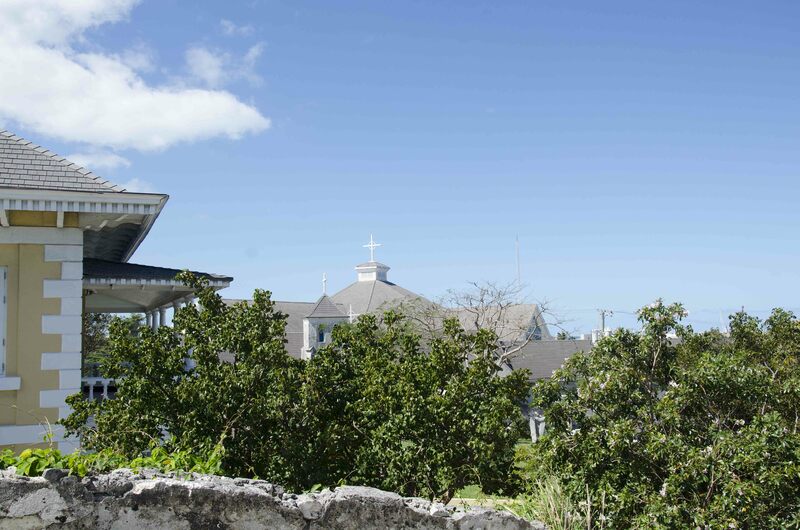 St. Francis is actually another historic site, as the oldest catholic church in The Bahamas. Hope your weekend is as clear-sky sunny as this day was!